For some time we have been working with The Frame and Log Cabin Company Ltd to provide them with gable end frames and joists for their popular range of timber framed cabins. 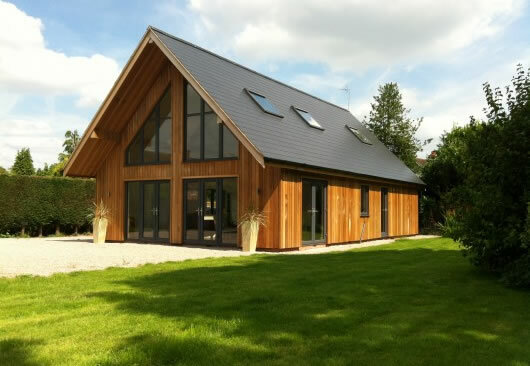 The timber used is machined to the size required for each type of log cabin, the gable is then constructed by bolting the frame together using specially made steel corner plates. The finished gable is then deconstructed and packed up in kit form before being transported to site. The Farme and Log Cabin Company have supplied a number of cabins, including their Littlebeck, Runswick, Tanfield and Albany styles to the Falkland Islands where they are being constructed as part of the expansion of Port Stanley. As you can imagine the cabins have to be slightly higher specified than the UK variants to ensure that they can withstand the South Atlantic gale force winds on the treeless Falkland Islands. We are delighted to be working with the Frame and Log Cabin Company on this project which shows that we are more than just a timber merchant! Please call our sales team on 01472 350151 if you would like further information on the bespoke products that we are able to offer.